Today’s snapshot is all about increasing customization further, with new possibilities on the navigation toolbar and even more options for sound. We have long planned to make individual buttons within our toolbars more configurable. Today we take a further step towards that goal by allowing you to turn off individual elements in the address toolbar. Just right click and remove them via the context menu. 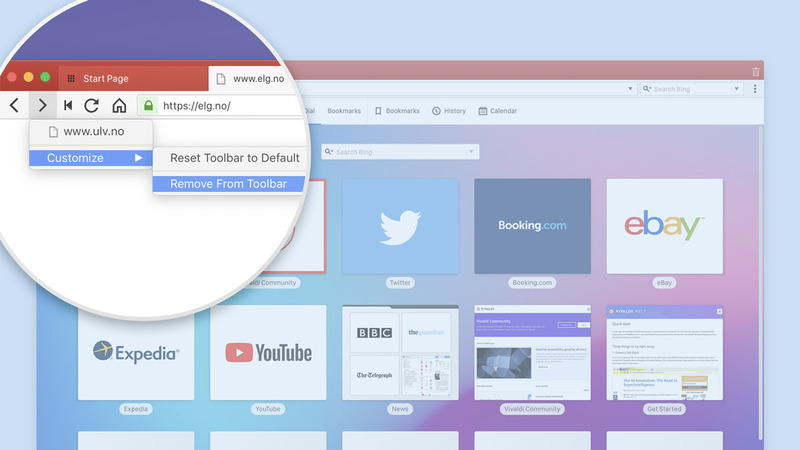 Now you can have a toolbar that displays only the buttons you need. To reset the navigation toolbar back to its default state, right-click anywhere on the toolbar and select “Reset Toolbar to Default” or head to “Settings → Address Bar” and click on “Reset Navigation Toolbar to Default”. You may ask, “Don’t we already have this‽”. Yes, we already have a keyboard shortcut and quick command to mute other tabs …but these only apply to the foreground tab. Now you can right click any background tab and mute all EXCEPT that tab. It may be a small thing, but it demonstrates that Vivaldi is in a league of its own with regards to fine grained control of tabs.